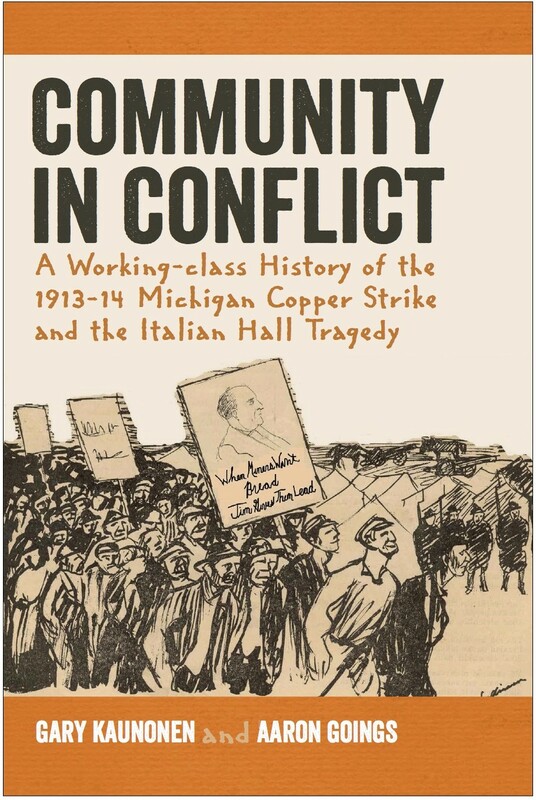 We are very proud to share the cover to the upcoming book, Community in Conflict: A Working-class History of the 1913-14 Michigan Copper Strike and the Italian Hall Tragedy. The book itself is the culmination of research going back almost 10 years. I (Gary) had been working with sources from the Copper Country's Finnish immigrant population, which was instrumental in bringing about the strike and also during the strike while working on a Master's at Michigan Tech and some of these sources were inevitably used in Community as well. Aaron and I started working together on the book in 2011. His expertise in the national labor scene at that time gives Community in Conflict something that other book length histories of the strike do not provide: a national context. Workers in the Copper Country did not live in a vacuum, and national events in the labor movement and business and management relations had great impacts on local workers and their surroundings in the Copper Country. That is the "community" in Community in Conflict--we strive to paint a whole picture of the Copper Country's labor movement and not just what happened in the mines and streets of the Copper Country during the dates of the strike. Thus, the book is a look at not only striking workers, but their families, the copper bosses, and the social and political environment in which the Copper Country's working-class lived. 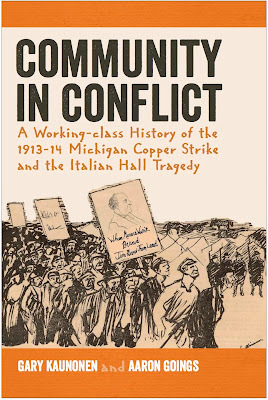 The back story provided in the book leads up to the great clash between labor and management that was the 1913-14 strike, and the truly tragic events at Italian Hall--mostly with regard to and using the perspective of the Copper Country's working class members. The cover itself is a symbol of our attempt to include the personal stories of members of the Copper Country's working class. The artwork on the cover is an engaging political cartoon drawn by Konstu Sallinen, a Finnish immigrant working at the Tyomies Publishing Company in Hancock, Michigan, during the strike. Salllinen drew the cartoon in the early days of the actual strike and captured the "conflict" that was consuming the Copper Country at that time. His artwork is an artistic first person perspective on conditions from a working-class perspective. You'll note in the Sallinen's cartoon the haggered, but determined look look on many of the strikers' faces. One striking worker is carrying a sign that reads a familiar slogan shouted during strike parades by workers. In the background the artillery of the Michigan National Guard sits ready for use, while Michigan National Guardsmen themselves stand watching strikers with guns outfitted with bayonets next to military issue tents. We felt the image was a powerful representation of the tension and conflict simmering in the Copper Country. While we selected the image, Michigan State University Press, our publisher, employed an incredible graphic artist to select the color scheme, font, and organize the cover's layout. We feel the graphic artist did a great job and when we first received the cover to look over from the Press, Aaron had copies made and distributed them throughout St. Martin's University where he teaches.